Refreshing autumn breezes are blowing over the Broward. Relief at last. Hope you don’t eat too much candy this week and remember the Reeces cups are mine! Last year at this time I shared with you my never-ending saga of attempts to capture photos of Old Man River, the Patriarch of the Broward. 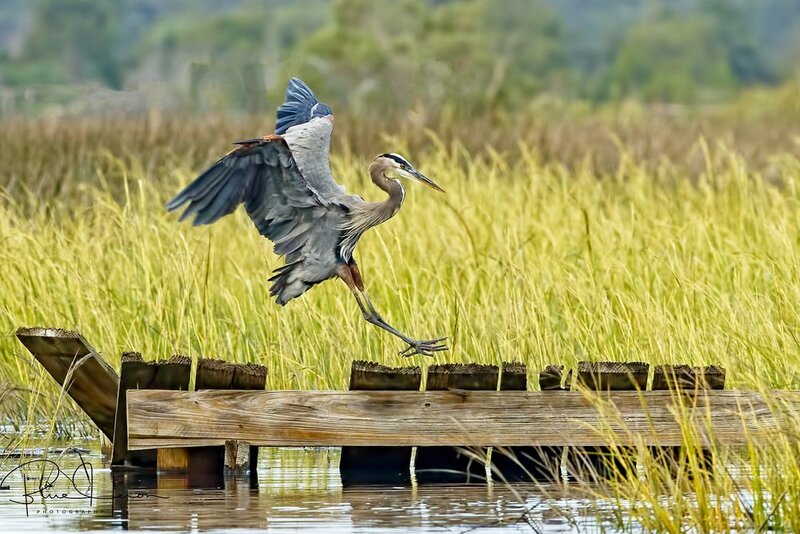 This venerable Great Blue Heron recently showed up on the same old favorite perches as last October’s Stubborn ole man blog article articulated (Jon boat and old pier). History does repeat itself on the Broward it seems. Omar, (short for Old Man River) sits on the old dock while scratching his head and keeping a wary eye on me. With the recent daily flooding on the Broward I can only sit on my dock and use my longest lens to capture a photo. This old bird will not let me come close and so the contest continues. Overhead a juvenile Great Bald Eagle circles. The partially white head and yellowing beak give clue to its age as most likely a third-year eagle. By four years their head and tail are all white. A gulp flight of cormorants in a V-shaped wedge pass over the Broward. A pair of Red-shouldered Hawks and a few Coopers Hawks are becoming a frequent sight also. Wood Storks will be starting their winter nesting at the local zoo. 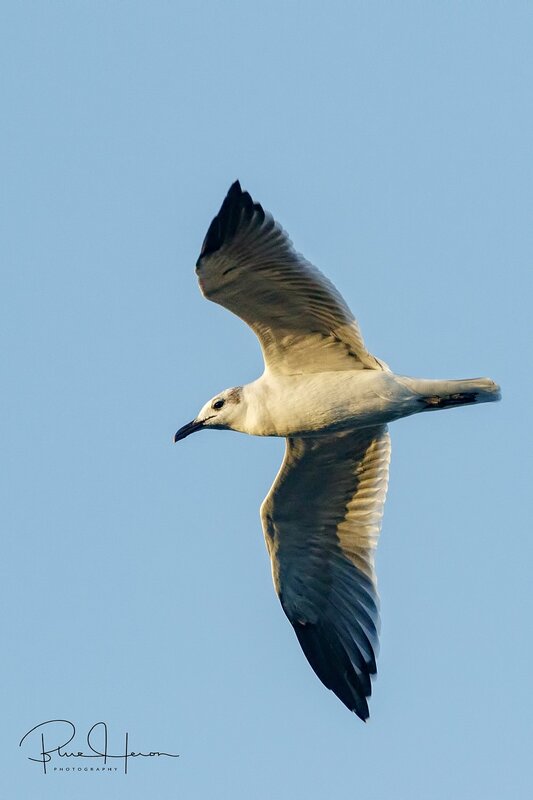 I see them daily now flying over the river. 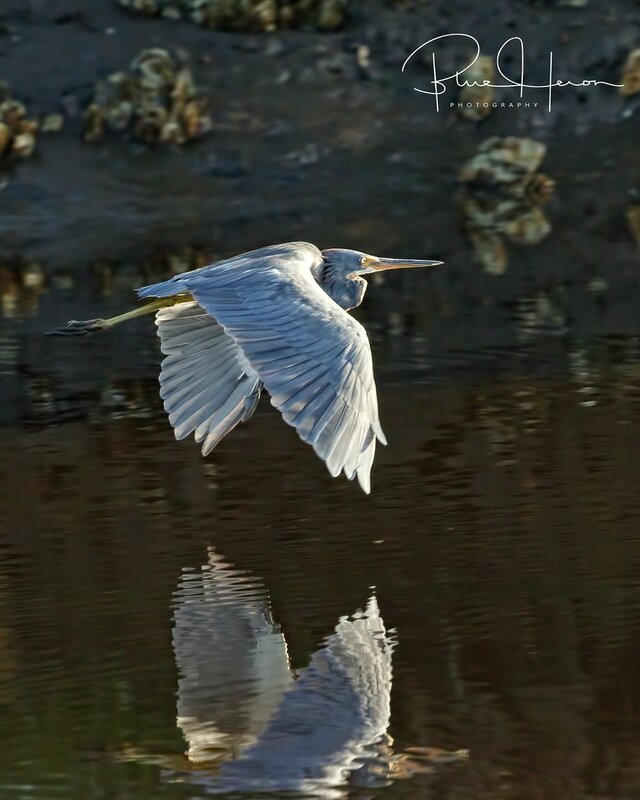 Some photo friends are also seeing nest building activity with the Great Blue Herons. Might be time for some road trips. Old Man River (Omar), the Great Blue Heron and Patriarch of the Broward touches down on one of his favorite haunts, the old pier. OMAR scratches his head and ponders how he can avoid me getting better photos..
Juvenile Great Bald Eagle, probably three years old circles the Broward .. Saw three V shaped wedges of Cormorants, such a flight is called a "Gulp, flight". 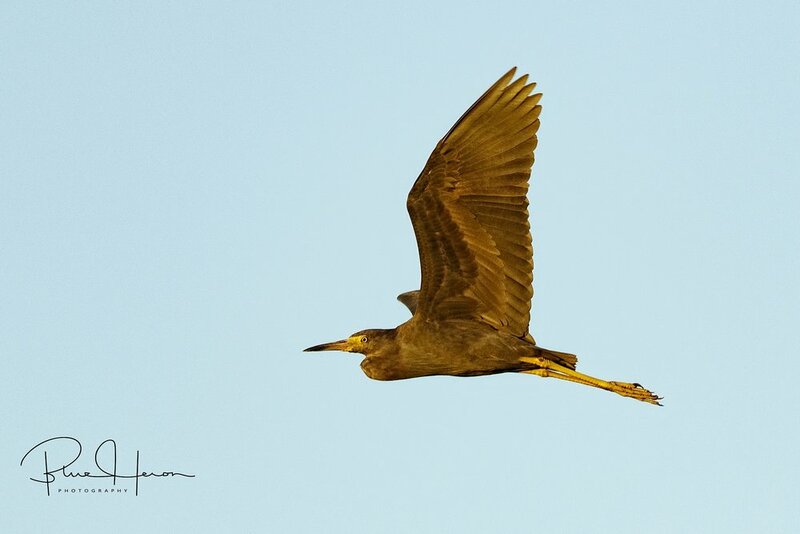 A young blue heron glides by in the shadowy light of the pre-dawn morning (juvenile Little Blues are white feathered initially) . 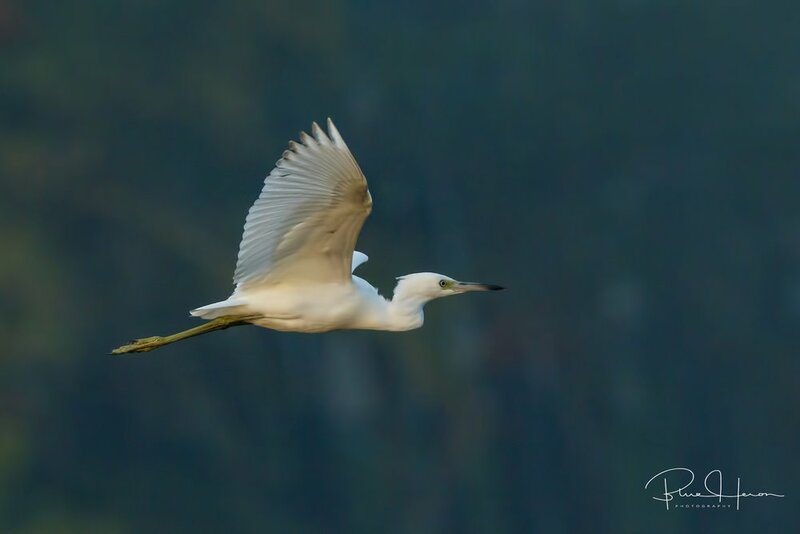 Like a whisper in the wind its silent flight brings peace and tranquility to my mind. Words begin to repeat in my mind. My thoughts ponder the meaning. I know that still small voice in my ear so when I return to the house I ask the editor for a yellow pad and begin to write the prose as best I can recall. The Broward seems empty save for a few visitors this week. I glance out the window as a flash of pink disappears in the marsh grass. 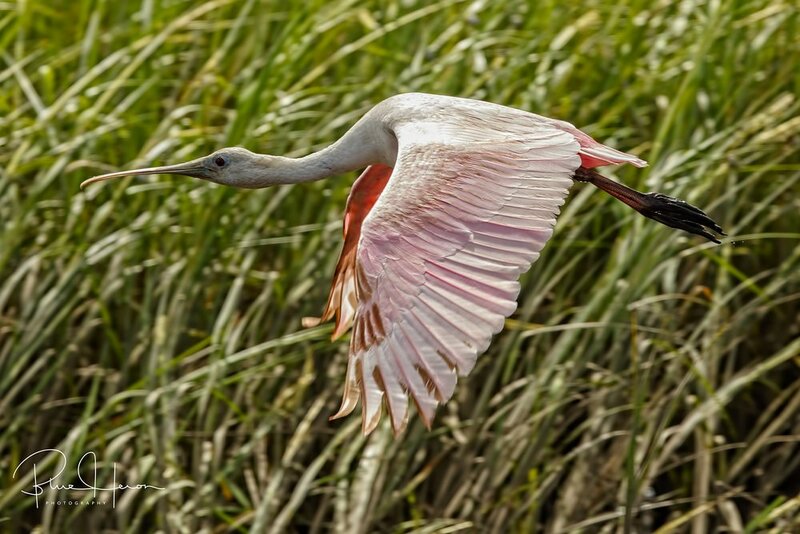 Grabbing the doohickey, I start up the dock only to stop and wait as two Roseate Spoonbills emerge in the channel. Their sweeping feeding motions are interrupted by a Snowy Egret as it looks for minnow stirred up by the spoonbills. I creep closer to no avail. The spoonbills spot me and after a brief discussion take wing. But not before I push the doohickey. 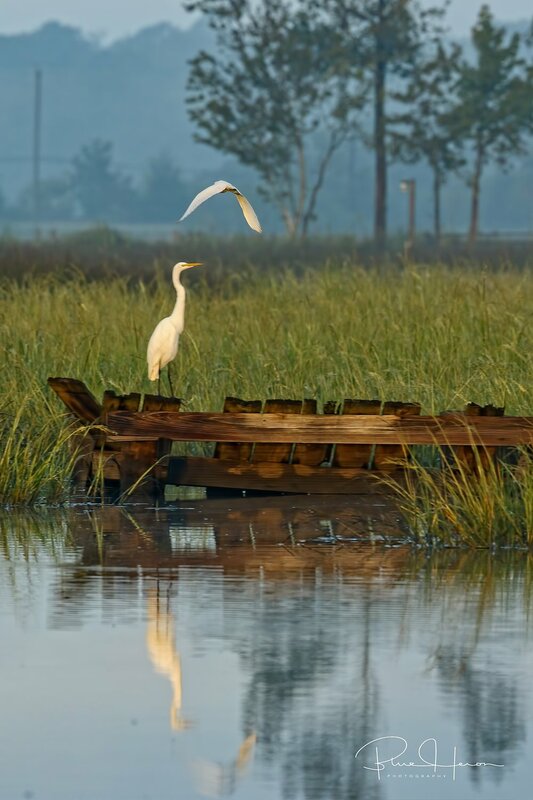 The Snowy also takes flight and swoops by a Great Egret on a neighbor’s crumbling old dock. 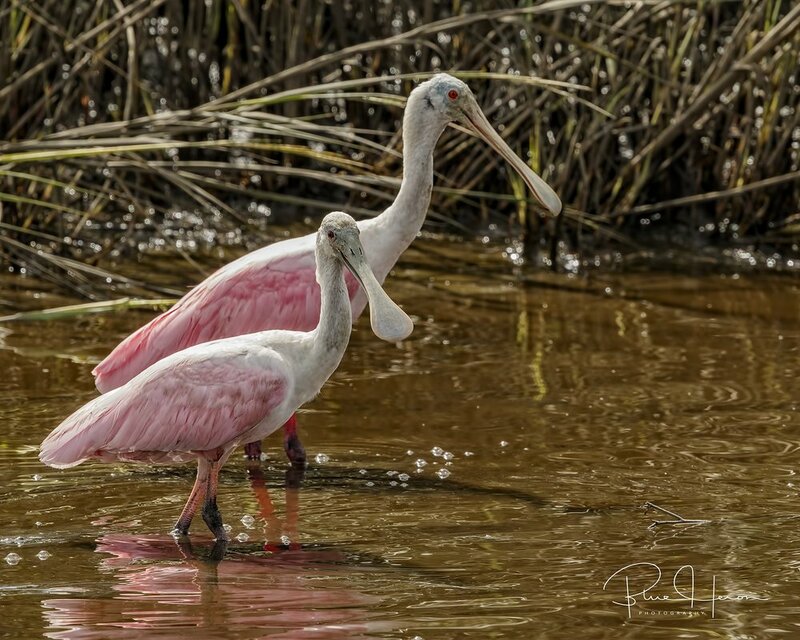 A pair of Roseate Spoonbills pause from their feeding and give me the eye.. In the blink of an eye they take wing ..hmmm..someday I will too..
A dark rose colored hue filled the pre dawn skies. By the time I could grab my shoes and camera the hue had faded to a pale pink. You only have but an instant to catch it at the peak of color. Missed it! A waning gibbous moon was setting in the west. The fall harvest moon had since passed. So began another fall morning with little activity on the Broward. Autumn blues seem to overtake me. A Little Blue Heron took off before I could capture a decent shot. Another of the blue herons, a Tricolored, landed on the dock and seeing me quickly sped up the Broward. A fleeting shot was all I could muster. In the distance I heard the call of one of the local raptors, a Red-shouldered Hawk traversing the river. Too far away. Perhaps it was looking for a fresh crow for breakfast. They seem to be the only birds frequenting the area. 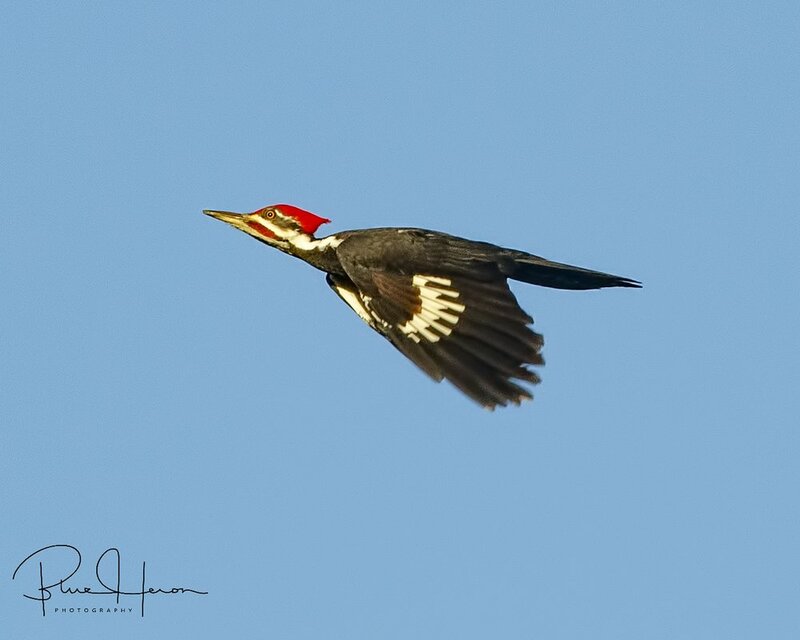 The female mate to the local Pileated Woodpecker did an over flight. The absence of the red-feathered band behind the beak delineates this from the male. At least it wasn't blue. 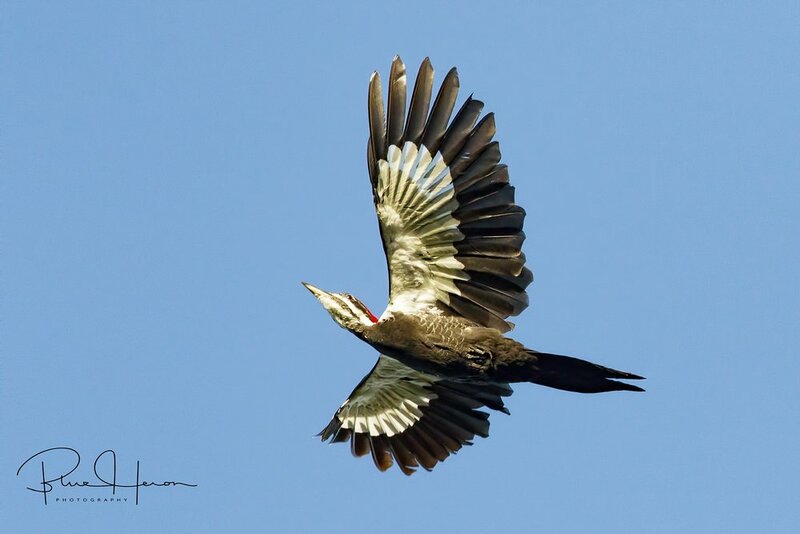 Overhead shot of the female Pileated Woodpecker..
A waning gibbous moon sets in the west.. Fleeting capture of a Tricolored Heron leaves me blue.. This week I have “something to crow about”, which is much better than “nothing to crow about”. Are you often referred to or compared to an “old crow”? Or is your favorite whiskey “Old Crow”? How far is it “as the crow flies”? Has anyone you know ever had to “eat crow”? Ever wonder where these expressions came from? If you are familiar with Lancaster Pa, you know that “something to crow about” is an annual event. Some “odd birds” in that town got together and decided crows had been given a bum rap for too long and decided to do something about it. Like Lancaster Pa, our area has seen a large influx of wintering crows arrive. Our local crows, called Fish Crows, have a much different sounding call or “caw” than these raucous invaders (I still think most of them are from New Jersey). Per the Cornell Laboratory of Ornithology “American Crows are very social, sometimes forming flocks in the thousands. Inquisitive and sometimes mischievous, crows are good learners and problem-solvers, often raiding garbage cans and picking over discarded food containers. They’re also aggressive and often chase away larger birds including hawks, owls and herons". Some scientists now believe they are smarter than dogs or chimpanzees. They can remember a face for years it has been shown. Can you say the same or have you too seen a face you should recognize but just can’t? You must be an “old crow” then. Hope you enjoy eating some crow today. Some local woodpeckers also captured my attention this week, not much else to crow about though on the Broward. Some of my readers think I am nuts or squirrely lately...wonder why? A crow walks into a Broward Bar..Bartender says what will ya have...Old Crow of course..
Just how far is at "as the crow flies"? Who you calling Jersey boy there Mr Doohickey? "Caws" I'm not a crow..I am a Pilated Woodpecker! “Rocket Man” is in the news lately. That is when they are not talking about the disgrace of the NFLs recent actions. Let me tell you about another “Rocket Man”. His real name is Funky, partner of Spunky the Belted Kingfishers of the Broward. As I sit in my chair on the dock I hear a familiar “Chitta Chitta Chitta” call. Seconds later Funky goes rocketing by followed closely by his mate Spunky. They fly overhead and circle the lagoon. When they spot me below they decide not to hang around for long and rocket by again back to the opposite bank of the Broward. 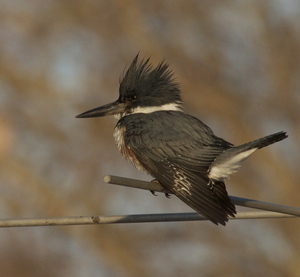 Photographers all over Florida are reporting Belted Kingfisher sightings this time of year. However, everyone comments how illusive they are. Funky and Spunky are no exception. As soon as they see me come out the back-porch door with my camera they are off like a rocket. I have a new perch pole set up nearby hoping I will catch them sitting and fishing from it. They have used it a few time already, but I have been hesitant to sit there with my camera. When they get used to the new fishing spot then it will be time to try and capture more photos. In the interim, these few images are all I have to share for now. George, the familiar Yellow-crowned Night Heron has not been seen for a while. Hope they return next spring. Rocket Man of the Broward, "Funky", the male Belted Kingfisher zooms by..
Spunky, the female Belted Kingfisher (brown belly feathers) rockets overhead and spots me too! This is a 2013 shot of Spunky, one of my first photo attempts..been a battle ever since to get one.. I think it is time to say adios to George the Yellow Crowned Night Heron, hope to see ya next year..unless I rocket out of here too!